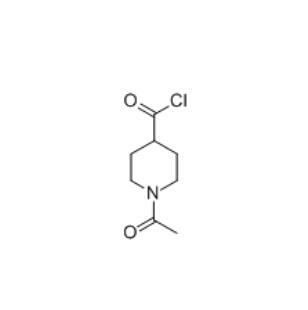 The full name of Risperidone Intermediate is 1-Acetylisonipecotoyl Chloride cas number 59084-16-1, Molecular formula C8H12ClNO2, Molecular weight 189.64, Appearance is white crystalline powder. we have more than 8 years of production history for 1-Acetylpiperidine-4-carbonyl chloride, we have absolute confidence in the quality control. In addition, we have a deep understanding of its market situation, with full of confidence in product competitiveness. Based on this understanding and confidence, we dare to do more inventory and not afraid of inventory will cause the backlog of funds affect the normal operation of enterprises. In order to consolidate the advantages and expand production we are jointly associated with the large Pharmaceutical companies in the laboratory for the development of 1-Acetylpiperidine-4-carbonyl chloride`s downstream high value-added products. Looking for ideal 59084-16-1 Manufacturer & supplier ? We have a wide selection at great prices to help you get creative. All the Intermediate of Risperidone CAS 59084-16-1 are quality guaranteed. We are China Origin Factory of CAS NUMBER 59084-16-1. If you have any question, please feel free to contact us.